In a medium bowl, whisk the mayonnaise with the lime juice, shallot, garlic, chives, tarragon, paprika, celery seeds and olive oil. Season with salt and pepper and fold in the chopped cooked lobster meat. Refrigerate until chilled. In a skillet, cook the bacon over moderately high heat until crisp, about 7 minutes. Transfer to paper towels to drain. Preheat a grill pan. Spread the butter on the cut sides of the rolls. Grill the rolls cut sides down over moderate heat until toasted, about 3 minutes. Transfer the rolls to plates. Mound the lobster salad on the grilled rolls. Top with the crisp bacon and tomato slices and serve. The recipe can be prepared through Step 1 and refrigerated, covered, for up to 8 hours. 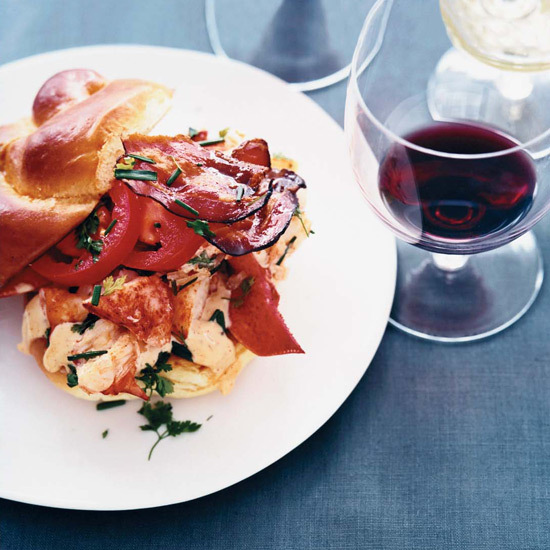 The Wine Luxurious ingredients like lobster (and rich ones like mayonnaise) pair best either with a moderately tannic red, like a Pinot Noir from Oregon, or a racy white, such as a Riesling from Alsace.